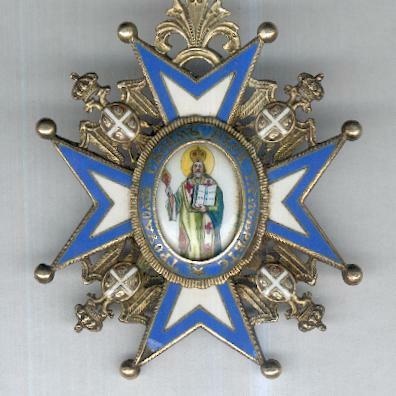 Large silver-gilt white-enamelled, blue-rimmed, gilt-edged Maltese cross with ball-tipped finials, double-headed crowned Serbian eagles between the arms, the royal arms imposed on their breasts, on swivel crown suspension with original ribbed silver-gilt loop with beaded edges for neck ribbon; the face with a central oval medallion bearing the polychrome enamel three-quarter length portrait of St. Sava, his right hand raised in blessing, a staff in his left hand, within a blue ring inscribed in gilt letters with the Old Church Slavonic inscription ‘One’s Own Work Achieves All’; the reverse with a white enamel central oval medallion bearing the date ‘1883’ in silver gilt letters, encircled by a blue enamel ring decorated with gilt laurel leaves; height excluding suspension ring and loop 85.11mm (3.35 inches), width 51.91mm (2.04 inches); slight loss of blue enamel from the tips of some of the arms, most noticeably the lower left arm of the face; on possibly replaced correct full neck ribbon with ties. 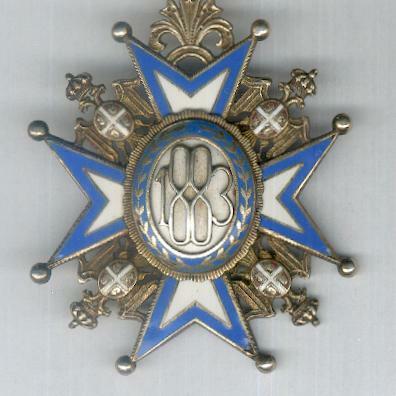 The Order was established by King Milan I Obrenović on 23 January (4 February) 1883 and named for St. Sava (1175/6-1235/6). 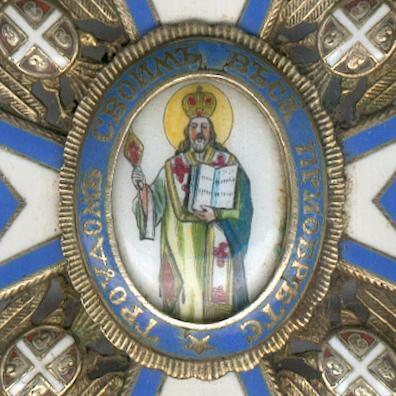 St Sava was the son of Stefan Nemanja, founder of the medieval Serb state, and was the first Serb archbishop (1219-1233), most important saint of the Serbian Orthodox Church and patron saint of Serbia. 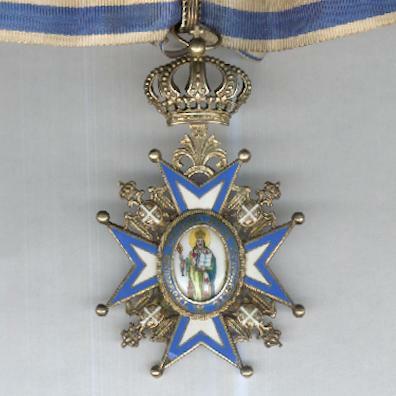 The Order was a civil decoration, to be awarded especially for services to the Church, to the arts and sciences, as well as to the royal house and the state. 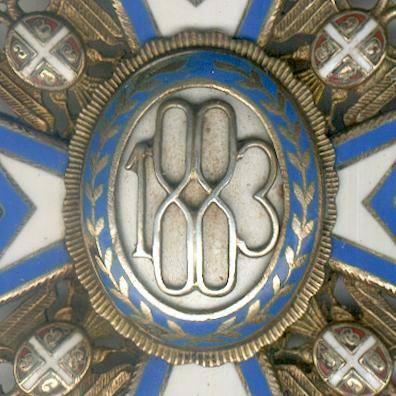 After the overthrow of the Obrenović dynasty in 1903, King Milan’s cipher was replaced on the reverse with the date (1888) of the founding of the Order. From 1921, the saint’s robe is green rather than red. 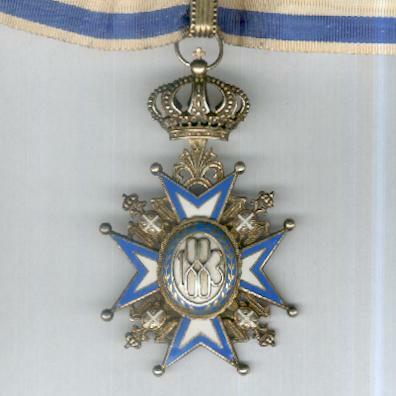 The Orders were mainly manufactured by G. A. Scheid of Vienna until the outbreak of World War I in 1914, after which the insignia were made by Arthus Bertrand of Paris (France) and Huguenin Frères of Le Locle (Switzerland), as in this example, later by Yugoslav workshops such as Fran Sorlini of Varaždin and Griesbach & Knaus of Zagreb. 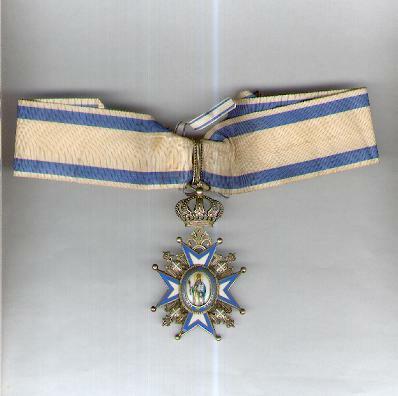 This example dates from the 1920s.